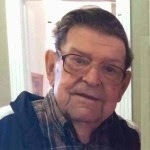 St. Alban's Episcopal Church: A Celebration of the Life of George E. "Frenchy" French, Jr.
A Celebration of the Life of George E. "Frenchy" French, Jr.
A Celebration of the Life of George Edward French, Jr. will be held at St. Alban's on Saturday, April 25, 2015. Visitation with the family will be from 1:00 - 2;00 p.m. in McLean Hall. The Burial of the Dead: Rite Two with Holy Eucharist will follow at 2:00 p.m. in the church.